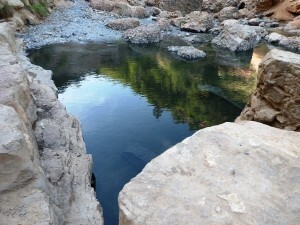 Diamond Fork Hot Springs – Hike and then soak at these sulfurous springs. After ascending some 2.5 forested, creekside miles, the trail opens to the thrilling sight of a significant waterfall. Three sets of simply constructed, deliciously hot soaking pools border Fifth Water Creek by the falls. Here you will encounter a diverse range of public regulars, from Boy Scouts to the Burning Man crowd. Soaking in the buff, though not officially-sanctioned is, in this magical forest setting, still an option exercised by some naturists. 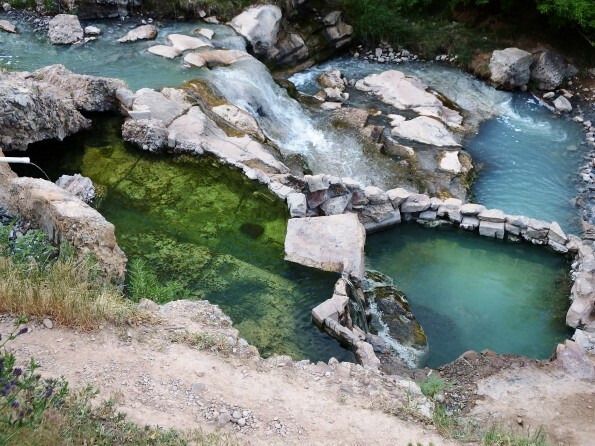 Midway Local Springs – Located just outside Midway proper, very hot piped-in water flows through a relatively long, clear, shallow, gravel-bottomed pool with dipping access on one side, and dense thickets of willows and cattails along the other. This soak is a quick and easy, right-off-the-road, natural experience; though depending on the eco-consciousness of previous visitors, the surroundings can feel bucolic and pristine, or lamentably unsophisticated. Crystal Hot Springs – Seven bucks gains you entrance to a year-round public soaking and swimming facility, a destination popular with families, locals and those seemingly afflicted. 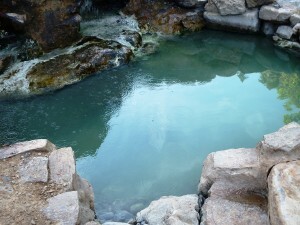 The on-location presence of both hot and cold springs yields various, regulated temperatures in different pools and tubs. The lodge building houses old fangled lockers and changing rooms. Similar to a conventional public pool facility, the vibe here is fun-with-rules. The Homestead Crater in Midway – What looks like a 55-foot high, earthen igloo is actually the accumulated result of thousands of years of deposited limestone covering a 65-foot deep pool; a mineral-rich pool so blue and warm it’s hard to imagine you’re not in the Caribbean. Swimming, or soaking for a casual, pre-reserved hour, is open to the paying public. Expect to share your out-of-the-ordinary swim with scuba classes.